Dream Downtown: Opening in early July, the glitzy downtown sibling (www.dreamdowntown.com) of hotelier Vikram Chatwal’s midtown Dream Hotel is set to become Chelsea’s shining star – literally. Located at 355 West 16th Street in the same porthole-dotted, Albert Ledner-designed building as the Maritime Hotel, Dream Downtown has a modernist façade that's been sheathed in reflective stainless steel, making it a neighborhood standout. 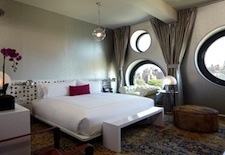 The theme continues inside with reflective surfaces and circular design details in the common areas – inspired by Andy Warhol’s Factory and artist Anish Kapoor’s “Sky Mirror” – and in the 316 striking rooms and suites (starting at $295/night in July, then $395/night). Rooms (shown at right), all with signature porthole windows, chrome accents, Oushak rugs, and free Wi-Fi, are divided into Bronze, Silver, Gold, and Platinum categories (in ascending order according to size, from 285 to 480 square feet), with bathrooms that range from compact to roomy and have chain-metal shower curtains and sleek chrome toilets. There are also a limited number of Platinum Pool Suites offering direct access to one of the hotel’s oases, a guest-only outdoor terrace (shown above at left) featuring a small beach and a heated pool with a translucent bottom visible from the lobby. The other social venues, which are open to the public, are the panoramic, “1980s excess-inspired” rooftop PH-D lounge and the lobby Marble Lane lounge and restaurant. The hotel’s featured eatery is Romera, a 65-seat high-concept restaurant (with a $265 prix fixe tasting menu) by Spanish neurologist-chef Dr. Miguel Sanchez Romera, which will open by late summer. YOTEL: Affordable rates (starting at less than $200 a night) and spare, white-on-white, space-age design (there’s a “Yobot” that stores your luggage in the lobby, and the reception desk on FOUR, the hotel’s social hub, is called Mission Control) make this brand new, 669-room property (www.yotel.com), located at Tenth Avenue and 42nd Street, stand apart from its competitors. Inspired by first-class airline cabins and Japanese capsule hotels, rooms at YOTEL are called Cabins and range from a tight but ingeniously designed, 167-square-foot room with a floor-to-ceiling window and queen-sized bed that moves electronically into a semi-sitting position (shown at left) to a more generous, 327-square-foot space (in the First Cabins, nine of which have terraces with Jacuzzis and start at about $400 per night). Best of all is The Terrace, New York’s largest outdoor terrace with a spacious lounge area with two bars, chairs, tables, and daybeds where you can sip a signature strawberry-lychee mojito and nibble on small plates ordered from Richard Sandoval’s DohYO (more dining info next week) as you watch the sun set beyond the Hudson River (and long after as the bar stays open until 1:30am on Friday and Saturday). Mondrian Soho: If visually arresting interior design is your thing, book a room at the five-month-old Mondrian Soho (www.mondriansoho.com), with its past-meets-future periwinkle blue-and-white fantasy-boudoir décor by Benjamin Noriega Ortiz, inspired by Jean Cocteau’s 1946 film La Belle et la Bete. Located at 9 Crosby Street and operated by Morgans Hotel Group, the Mondrian has public spaces resembling whimsical stage sets, and its 270 rooms and suites (called “Sleeping Chambers” and starting at $329/night) are surprisingly light-filled and serene, done mostly in white with floor-to-ceiling windows, blue carpeting, blue-and-white toile bedding, and retro chrome tables and nightstands. Just off the lobby is Imperial No. Nine, an elaborate, crystal-accented, 150-seat sustainable seafood restaurant by Chef Sam Talbot. 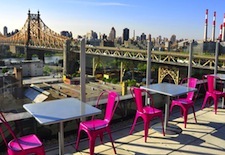 Z New York Hotel: Located in Queens – yes, Queens – this brand new, 100-room hotel (www.zhotelny.com) offers something no property in Manhattan can: Z Roof, a 5,000-square-foot roof terrace with a stellar view of the Manhattan skyline (shown at right). Sure, the Long Island City address is industrial and not too chic, but it's just blocks from the East River and the 59th Street Bridge (and just one subway stop or a free hotel shuttle ride away from Manhattan). What's more, Z New York Hotel has a sleek, clubby vibe with Jazz Age themes, stenciled walls (taxis, Rockettes, Billie Holiday), and dark neutral decor. Rooms (from $189/night) are available in three configurations, all compact but with 10-foot ceilings, floor-to-ceiling windows with skyline views, and free Wi-Fi (only the 10 king-bedded rooms have bathtubs, while the queen and twin rooms have showers). The subterranean Z Restaurant and Lounge serves artisanal American cuisine (think gastropub), but the star is Z Roof, featuring two bars, a pizza oven, and that view! 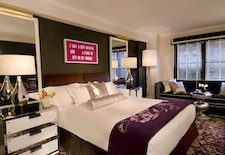 70 Park Avenue Hotel: While not new, this 205-room, pet-friendly Kimpton Hotels property, located on Park Avenue at 38th Street (room from $299/night), has just completed a top-to-bottom renovation of its rooms and suites (shown at left). The resulting décor is both sophisticated and playful, and retro and contemporary. Cream walls and a floral carpet set the stage for a palette of chocolate brown and purple, accented by shades of pink (some bright, some metallic) with statement pieces such as mirrored bedside tables and a tufted wing-back chair. See our New York City Travel Guide for more trip-planning information, then use our Travel Search price comparison tool to find the lowest rates on flights, hotels, packages and more travel deals.